We've said it before and we'll say it again, if you want a bargain priced, great performing smartphone, you can't go wrong with Motorola. 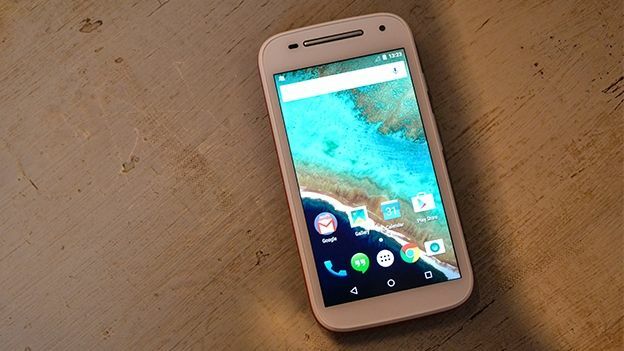 So, how does it's latest super affordable device, the Moto E 2015, stack up? About a year ago, Motorola unleashed the baby of the its mobile line-up - The Moto E. The bare bones device offered up a stock version of Android, a stellar build and enough grunt under the hood to help it run beyond it's bargain price tag. Now, after updating both the Moto G and Moto X in late 2014, Motorola is back with the Moto E 2015. Instead of releasing the device at a lavish press event, the likes of which have become almost a pre-requisite for a new smartphone, Motorola teased members of the press with a 'Mystery Box'. Inside was our review unit and our own personal launch event, which we enjoyed at our desk. No running across London required. There are plenty of improvements this time around, though the real headline is still the price-tag which sits at £109.99. Even so, with the original Moto E costing a mere £80, are the improvements this time around worth the price? Let's take a first look. For a phone that costs barely more than £100, we're mightily impressed with the standard of build quality here. While the metal rim from the Moto X is nowhere to be found, the sturdy plastic case, slightly textured on the sides for improved grip, feels great in the hand. The back is ever so slightly curved, helping it nestle in your palm and though we tried, your not going to pull it out your pocket and find it has bent. Speaking of the back, the classic Motorola dimple is here in all its glory, giving your finger a place to rest while you hold the device. Motorola has even added in a couple of customisation options, letting you change the colour of the textured band which runs around the sides of the phone. We replaced the regular white rim with a bright red version, which we have to say looks great. The unit itself is available in black and white, though six coloured rims, plus a larger Grip Shell, which adds further protection, are also available. Hiding under the removable rim is the microSD card slot, always a nice addition and up-to 32GB is supported, along with the sim tray. One of the biggest additions this year is support for 4G data. While these super-fast data speeds have been common place on the top-tier smartphones for a couple of years now, the budget conscious folk are only starting to see to the tech trickle down to the cheaper devices. Motorola didn't even include 4G on its latest iteration of the Moto G, the brands slightly pricier smartphone, so it's a nice surprise to see it here. Speeds, from our initial tests on the 3 network, seem pretty impressive too. The next area that has seen a significant improvement is the specs. There's a quad-core 1.2GHz Snapdragon 410 processor running the show, while the internal memory has been doubled from 4GB to 8GB. Scrolling around the Android interface didn't leave us longing for more power, from our first few hours with the device, with apps opening up quickly and web-pages loading as expected. We'll have to put the Moto E through some tougher tests though for our full review, to see if it really keeps up the pace. Motorola claims you'll make it through a whole day without having to juice up the 2,390 mAh battery, but again this is something we'll have to thoroughly test for our full review. Just like the updated Moto G packed a larger screen than its predecessor, the 2015 Moto E has made the jump from 4.3-inches to 4.5. While having more display real-estate is a plus, the resolution is the same, a fairly middling 540 x 960. Upon first glance though we weren't too disheartened. The colourful Android Lollipop wallpapers are bright and vivid, while the brightness can be jacked up quite a way. Instead of having to deal with pesky skins or bloated software, Moto is shipping the new Moto E with a stock version of Google's Android operating system. What makes this even better is that that version is Lollipop 5.02, that latest and most up-to-date release. Alongside the new Material Design infused look, Lollipop added a new way to multitask, updated versions of all the Google's apps and a host of other features to boot. It's easily the slickest version of Android yet. Even though Motorola stuck to a mainly vanilla version of Android, there are still a few added extras that are worth mentioning. First off is Active Display, a feature we raved about in our review of the Moto X. This lights up the display every time you get a notification, letting you easily check what it was and carry on without unlocking the device. it's It's not quite as snappy as the version on the Moto X, but it's inclusion is impressive nonetheless. You can also give the device is quick shake to quickly open up the camera, or have it so notifications and noises don't disturb you a certain time. The original Moto E completely ditched the front-facing camera, but with the ever-growing popularity of selfies Motorola has kitted the 2015 edition with a VGA camera up-front. That low-resolution does leave you with very washed out shots, but at least it's there if you need it. On the back the rear snapper has also been improved. The 5-megapixel sensor now has auto-focus, so expect snaps to be sharper, but we don't expect it to trouble the big boys of mobile photography. Even though we've only had the new Moto E in our hands for a few hours, we have to say that we're impressed. Packing in 4G, a dual-core processor, 8GB of internal storage and a microSD card, plus the delights on Android Lollipop into a well built package that costs just £109 gets the T3 thumbs up. Yes, it might not be the sleekest or lightest device, but the ergomonic design and durable construction are not lost on us. Stay tuned for a full review coming soon.